The Antibody Validation Workshop will bring together highly specialized scientists in antibody technology with PhD students and young scientists who use antibodies in their research. It will provide a set of criteria and recommendations that will help researchers to select the most effective mAbs from those available in the market and provide the strategic guidance needed to perform any essential antibody validation. This will include verifying antibody specificity, selectivity, sensitivity and reproducibility. 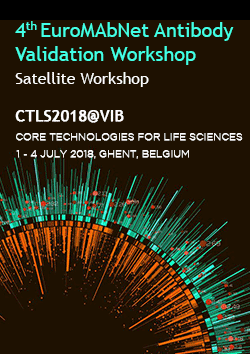 The 4th EuroMAbNet Antibody Validation Workshop will be held as a satellite event within the Core Technologies for Life Sciences (CTLS) meeting 2018. This four-day meeting is focus on all facets of core facility operations, management and specific technologies that are of interest to core facility staff. Attendees will be scientists, technologists and administrative staff working in, or allied to, shared resource laboratories, including core facilities and research infrastructure providers. 2nd Floor Het Pand Seminar Room University of Ghent’s congress center, Het Pand Onderbergen 1, 9000 Ghent (Belgium). 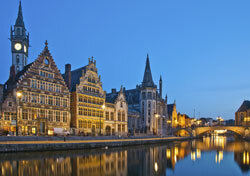 Map of Ghent. Berislav Lisnić, Department of Histology and Embryology and Center for Proteomics, University of Rijeka, Faculty of Medicine, Croatia. No refunds will be made in case of cancellation. Substitutions are acceptable at any time but should be informed by email at cmramos@srv.cnio.es before June 20th.